The tightly-wound 2015 American thriller Wild Card, directed by Simon West and starring Jason Statham, follows the story of a tough bodyguard who lands in hot water with the mob after he goes after one of their own. 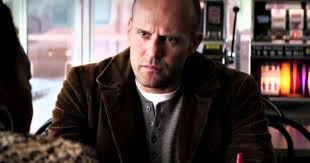 Nick Wild (Jason Statham) is a recovering gambling addict who takes odd jobs in Las Vegas as a "chaperone" (his version of a bodyguard) to support his addiction. After helping a client impress a woman (Sofía Vergara), he accepts a proposition from a young man Cyrus Kinnick (Michael Angarano) to show him around Vegas and provide him with protection while he gambles. The film is based on the 1985 novel Heat by William Goldman, and is a remake of the 1986 adaptation that starred Burt Reynolds.